The Landlords were the Lewins, Rutherfords, Kirwans, Staples and Bowens. 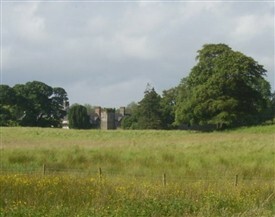 General Arthur Lewin owned part of the land of Kilmaine and occupied Cloghan Castle in the early 20tth century. 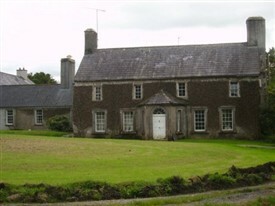 The house has been described as 18th century with 19th century alterations. General Lewis was an aviation enthusiast and went to live in Nairobi, Kenya in the 1930’s. Cloghan’s was sold in to the McCartans in the 1940’s and is now the home of the Kelly family. In the 1850s, the Rutherfords occupied Turin Castle. 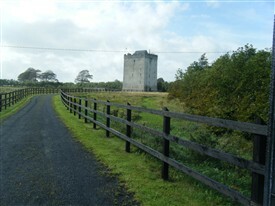 They owned a vast amount of land around Kilmaine and a gatehouse was situated at the entrance to the estate. That small building still remains. The Bowens of Co. Mayo appear to be descended from the Bowens of Ballyadams, Queen’s county (county Laois). Anthony Bowen Elwood held lands in the parishes of Kilcommon, barony of Kilmaine and in Kilcolman, barony of Claremorris. He was recorded as an absentee landlord in 1802 and the estate was run by his agent Charles Cromie, who resided at Annefield, Hollymount. My granny and grandad were given this gatehouse as a wedding present, my granny May Flanagan nee Mooney worked in Turin house and they gave her the gatehouse as a wedding present. My mum Kathleen Flanagan 84 years young, her sister Josie Flanagan RIP and their two brothers Tom and Pake RIP lived there. Tim & Rosaleen, there were Rippinghams in Coolylaughnan, more commonly known as Brownstown, Hollymount which is where my mother's family is from and is about four miles north of Ballinrobe. My mother's maternal uncle used to mention Rippingham as part of the family name according to my aunt. The Rippingham land that was leased per Griffith's Valuation in Coolylaughnan from as early as the 1857 publication of that record was passed to my mother's maternal family, the Heraghty's, which further bolsters the evidence of the relationship. I have seen Rosaleen's tree on Ancestry and noticed that her Rippingham ancestor married a Bartley and they settled in England. My mother's family is Bartley, so there would seem to be a strong possibility that they were all from Brownstown. You can reach me via email @ bbbmckeon@aol.com if you'd like any further details. That means we're cousins! My grandfather was Thomas Francis Ord Rippingham whose grandfather Christopher John Rippingham left Ballinrobe around 1850. Christopher had a memorial obelisk erected at the head of his parents and grandparents grave beside the old ruined church in the graveyard on High Street. Building on my grandfathers notes regarding the Rippinghams I have gathered up a huge amount of information on the Rippingham family who originate from Riplingham in East Riding of Yorkshire. The family pedigree in the British Library starts with Philip de Ripplingham 10 years after the Conquest. The original spelling of the name was Ripplingham, the "l" was dropped around the late 1500s. 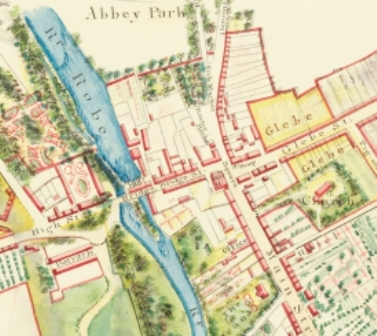 Unfortunately, the identification of their land in the Ballinrobe area has so far evaded me, though I believe they originally came to Ireland with the initial plantation of Coleraine [County Derry/Londonderry] and some of the family were later replanted to the Ballinrobe area. My great grandparents were born in Ballinrobe - Thomas Rippingham date of birth: 1831. Left in 1861 to go to Ashton-Under-Lyne Staffs UK with many others from Ballinrobe. Anyone know if this family were 'freeholders'? Hi, would anyone have any information on the Rippingham family of Ballinrobe? Milford House was featured in BBC4 programme 'The other Irish travellers', broadcast on 16/12/12. Rutherford Big House: There is a photo with Patrick Mooney holding the reins of a race horse at what appears to be the north side of the house at the corner of the front elevation facing west. There also appears to be tall pillars along that north side and bay windows near the corner; basement windows and a portico in the center on the west side. On a map the outline of the house appears to be square with a portico. An eye witness, who saw the house as a child, said that the hallway had animal heads displayed and that there were many windows. The will of Margaret Rutherford mentions an oil painting of Emily Gowen Tozzi or Fozzi; a large ivory vestal virgin and chippendale dining chairs among other things that she bequeathed to her brothers and sisters and nieces; Elspeth Howie (Barron), Dorothy Howie aviatrix and Alison Howie(Bailward). *** Ms. Evans has very kindly supplied the drawings and map which are published on this site and titled Rutford Big House by Elizabeth Lee Evans as a seperate article. Thank you for your interest and support. Regarding the mention of the Rutherford family,in fact,they did not occupy Turin Castle.They lived in Turin House,the mansion that stood,untill its demolition in the 1940s,a short distance from the Castle. I have often heard talk about the House but have never seen a picture of it.Would anyone have such an image of the building.It would be interesting to see it published on this site. Regards, Jon.